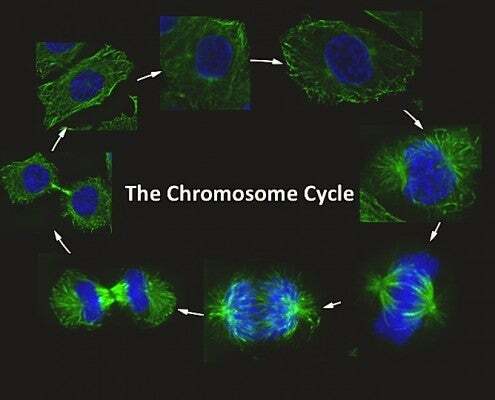 Two important stages of cell division are the accurate duplication of genetic information contained within chromosomal DNA and the segregation of the replicated DNA during mitosis. We investigate the mechanism and control of DNA replication in human cells and the yeast Saccharomyces cerevisiae. Previous studies resulted in the identification of many of the cellular proteins that function at the DNA replication fork during the S-phase of the cell division cycle, including proteins that facilitate chromatin assembly dependent upon DNA replication. These latter proteins propagate epigenetically determined states of gene expression and the inheritance of chromatin structures. We continue to study the epigenetic inheritance of chromatin structures in eukaryotes. The main thrust of our current research is to investigate the mechanism and cell cycle regulation of the initiation of chromosome DNA replication. A key protein that binds to origins of DNA replication, called the Origin Recognition Complex (ORC), initiates the entire process of making chromosomes competent for duplication. ORC binds origins of DNA replication and to other initiation proteins such as Cdc6p and Cdt1 to recruit the MCM helicase. Later steps in the process of initiation are controlled by cyclin- and Dbf4-dependent protein kinases. ORC subunits are also involved in the function of centromeres and in controlling the inheritance of centrosomes, the organelles that facilitate spindle formation during mitosis. Finally, ORC plays a major role in the spatial control of DNA replication in the nucleus and the timing of when different regions of chromosomes are copied in S phase.